One thing I have learned, in all of my studies, is to keep a notebook with recipes that worked, and didn't work so well. 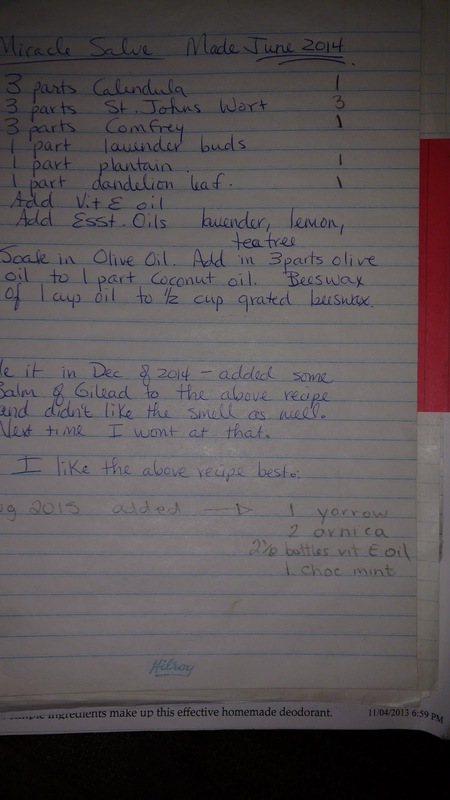 Write down what you did to adjust each recipe, and whether or not you loved it. I didn't do this at first and would make something from an herbal recipe I found online or in a book, and I either really liked it or it failed miserably, but I never bothered to write it down, so I couldn't refer back to it to make it again or not. I took a normal coil ring notebook, bought a few tabs, and have sections in my book of recipes to try and ones tried and true. I also have sections for things like deodorants, salves, lip balms, tinctures, perfumes, etc. It is just made up of recipes. I love it. 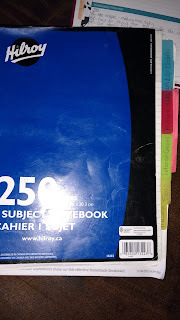 I have a section at the back for new recipes tried and I write notes on each one to help me perfect it for the next time, who used it, what date I made it, and so on. 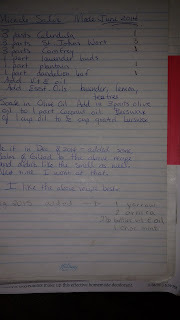 Here is the page where I keep my all time favorite healing recipe, I call it Miracle Salve. I have given out literally gallons of this salve. I choose not to charge anyone for it, because I have kind of made it my gift back to others. I have given the salve to friends, family, neighbors, co-workers, and strangers who have called me to say someone recommended this salve for whatever ails them. I really have seen it work miracles. Anyway, as you can see on this page, I have three versions of this particular recipe and a few notes that help me understand what I did and what I liked or didn't. It is just one page out of my notebook. Mix all of the herbs and add all of them in a large jar and completely cover them with olive oil. Let them soak on the cupboard for three or four weeks, shaking or turning the jar daily to keep stirring up the herbs. Strain oil and herbs through a cheesecloth or linen bag of some sort squeezing out all of the excess oil into a large pot. For each 3 cups of olive oil you have, add one cup of coconut oil and 1 1/2 cups grated beeswax. Melt over low to medium heat, making sure not to allow the oil to boil or get too hot. If it boils it will kill some of the healing properties, so heat just until everything is melted nicely. Remove from heat and let stand for a few minutes. Add in any essential oils or vitamin E oil you would like. Stir well and pour into containers that have a seal tight lid. Let stand until cool. Label and voila, you have the most wonderful healing salve for pretty much any rash, cut, scrape, burn, or skin issue. I tried making soap and wrote in my book that it completely failed, and then a new recipe and how it was a huge success! That was a few years ago. I did notice that I haven't always dated the year on my recipes, so I need to get better at that. But for the most part, I try to document everything. Here is a shot of the front of my book. Notice the tabs on the side of the different categories, making recipes easy to find. I love my recipe book. It is just one more of the many, many notebooks that sit upon my shelves and help keep me organized a tiny bit more. It is really nice to be able to go straight to my notebook when someone calls, and answer their questions or give them a recipe. 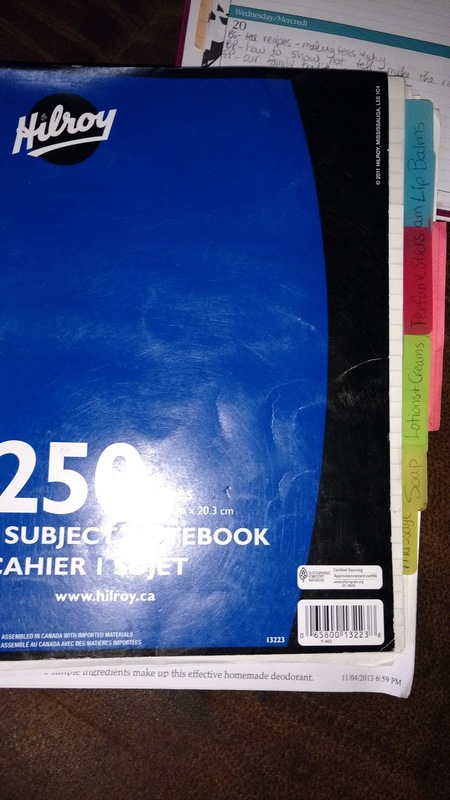 Keep a recipe book, whether in a notebook, a binder, or even a computer file. You will be glad you did.